I think its fair to say that most little boys are fascinated with powerful engines, arch wielding kits and heavy industrial environments. A recent photography commission for a Manchester based engineering company CPM, saw a return of these childhood fantasies, but this time I had a camera with me. CPM are a long standing engineering/industrial company who repair, renovate and maintain all manner of engines, motors, pumps, and submersible industrial and electrical equipment. The first thing I found when walking into their large industrial workshop, was a flood of overwhelming creative possibilities that each work area could yield. I had to take a strong grip of those childhood urges to go all shutter happy at anything that looks remotely gritty, industrial, metallic or fiery. This was pretty difficult as I was faced with old school lathes, wielding torches, metal sprayers, shot blasting and 200 tonne presses. Not quite a candy store, but for a photographer with a sense of childhood creativity certainly a difficult scenario to stay focused in. The shot above was just one from a full day of industrial photography for CPM. It shows the engineer using the metal sprayer within an enclosure and the scene was exposed using a mixture of photography techniques. The methodology of which I’ll explain below. A quick glance around the area revealed (as expected) a dark, dirty, heavily blackened fireproof enclosure. It had a small amount of natural ambient light which was provided from an opening above the enclosure, but the majority of the light was provided by overhead florescent lighting. I had in mind, that I wanted this shot to be dominated by the light from the metal sprayer, so I asked for the overhead fluorescents to be killed. I did this for 2 reasons, firstly I wanted the colour temperature within the shadows to remain neutral (fluorescent lights give off a strong green cast) and secondly, I wanted the shadow regions to remain as dark as possible thereby masking any grubby looking surfaces. The metal sprayer had a fierce white flame and I wanted to capture the glow and intensity of the light given off from this exciting industrial tool. To combat the poor light levels I set the camera on a tripod. A little guess work with the exposure for the metal sprayer got me to a close working exposure, that I then bracketed to achieve the correct exposure which varied with the intensity of the flame. Another problem on this particular shoot was focusing. Given the Health and Safety risks associated with this tool, dark-tinted ‘almost black’ glasses was required to view the scene whilst the sprayer was in use. I couldn’t see through these to focus correctly and the dark interior made using the auto-focusing system troublesome, so I manually pre-focussed the lens prior to the shoot. Tip: to obtain critical focus, zoom into the area of interest, set the focus and zoom out to your pre-determined composition. I set the camera colour temp to Tungsten as I suspected that the flame would be quite cold in nature. This worked out well after a few establishing frames I moved to fill a small amount of light into the scene. I didn’t want much, just enough to provide shape to the wheel in the front. This was achieved by using a small camera mounted speed-light bounced behind me onto a dark wall. After shooting a small amount of post-production was used to enhance the flame. I used a portion from a darker bracketed exposure of the flame to bring back some detail that had been lost and used a small vignette to intensify the mood. This was done using a mixture of Lightroom and Photoshop. I’m pleased with the result and would have loved to spent more time perfecting this shot, but the pressures of a long shoot list meant that all this was achieved within a 10-15 minute session. Industrial photography remains a great passion of mine and I think by holding onto some of that child hood wonder, enthusiasm and energy, it can really help you see past the everyday grime and oil coated environment and help you pre-visualise some wondrous industrial images. Here's some BTS video footage. I love to hear you thoughts so please comment below and feel free to share this post with your friends. Until next time. 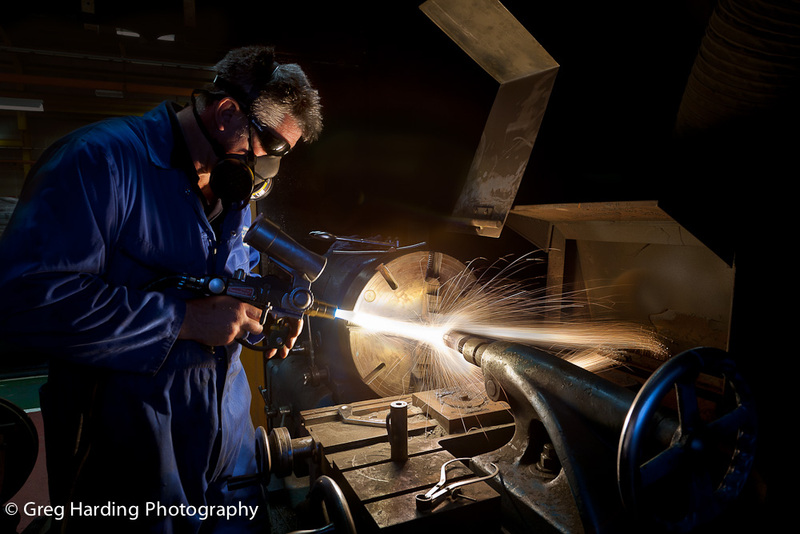 If you’d like to commission Greg Harding to photograph your industrial project please get in contact or if you’d like to see more industrial images please click here.